Seasonal tidbits for the avid gardener. Check our In The Garden page for full garden calendars complete with How To articles. Shallot sets arrived, too. Plant them now for harvest next year. We also have a new shipment of cover crop seed, great for erosion control and the legume mix for adding nitrogen back into your soil … naturally. Spread the seeds now and let Mother Nature water them in. Bedding plants for late summer and fall have arrived: color, veggies and perennials! 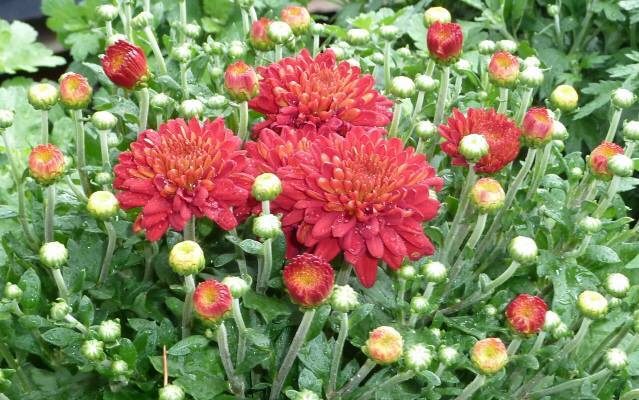 For great fall color, we have hundreds of garden mums in stock ready to bloom. 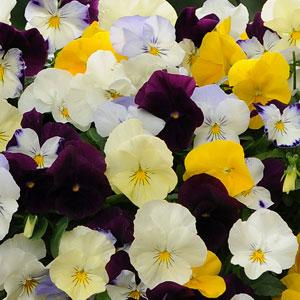 Have you tried Cool Wave Pansies? 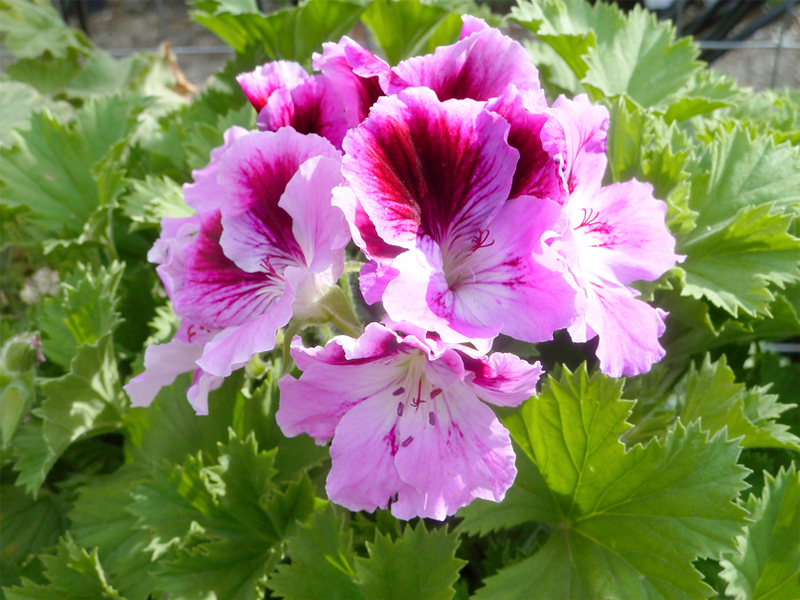 They are a great trailing style perfect for spreading in the garden or hanging from baskets and pots. 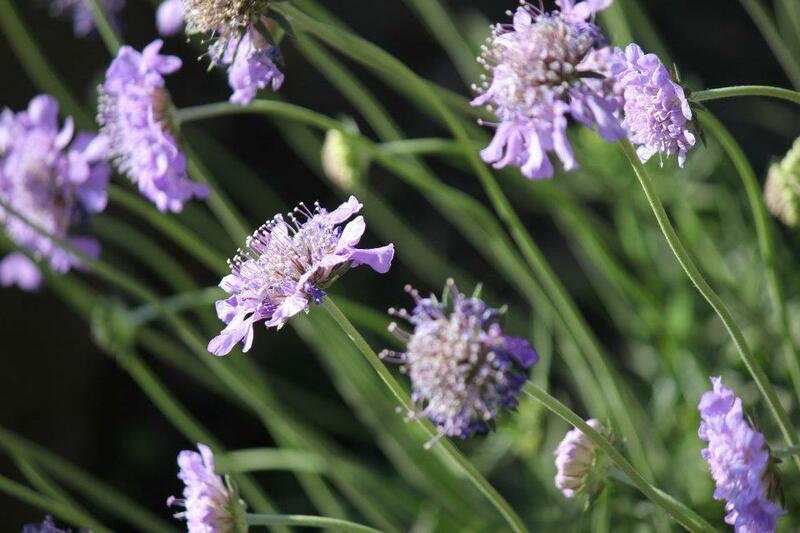 Phenomenal Lavender is a very attractive rebloomer which is very cold hardy and quite fragrant. How about a fall vegetable garden? The same plants we grow in the cool spring also do great in the cool fall. Choose from broccoli, cauliflower, cabbage, kale and lettuce, to name a few. 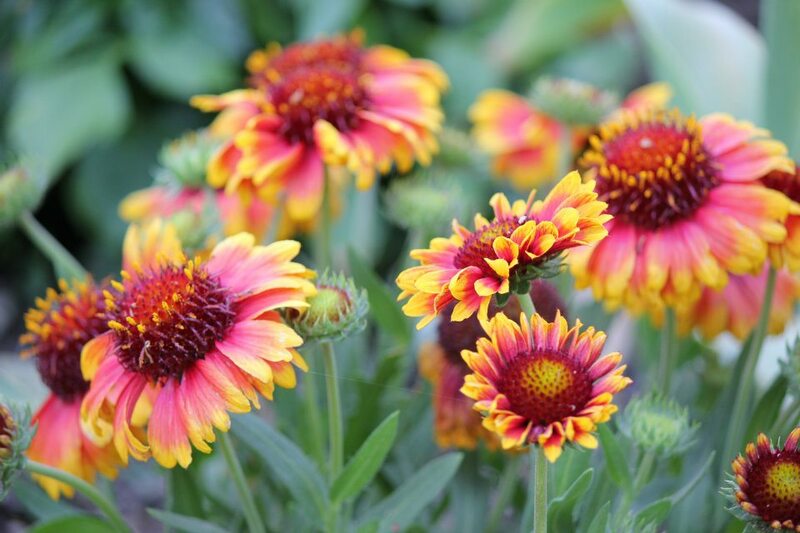 Are you looking to add to your perennial garden? They are cold-hardy, so will survive our winters just fine. Plant them this fall for bigger, bloomier plants next season. Check out our Fall Gardening Calendar for more seasonal gardening ideas and tips. It’s summertime in Trinity County! Time to shift gardening gears from planting to tending and harvesting. Here are a few tips to help you get the most out of your garden this summer. Water – Everything needs it, but be especially attentive to new plantings, pots and hanging baskets. A thick layer of mulch helps keep soil moisture from evaporating. Fertilize – Veggies, fruit trees, flowers, roses and lawns will all benefit from feeding this time of year. Remember to make sure your plants are well-watered before you feed them. Flowers – Keep your flowers blooming by dead-heading spent blossoms. 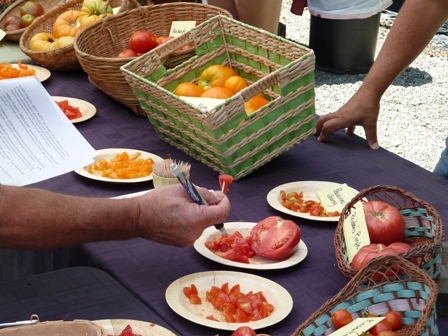 Check out our Summer Gardening Calendar for more advice for the summer season. Treat your Mom to a special day Sunday, May 11 — bring her into the nursery for a stroll amid lovely plants and our garden-inspired gift shop. (We’ll be open normal Sunday hours, 10 to 4.) She may even pick out her own Mother’s Day gift! Veggie Land is open and quickly filling up with tomatoes, peppers, zucchini, cucumbers and all of your favorite summer vegetables and herbs, herbs, herbs! 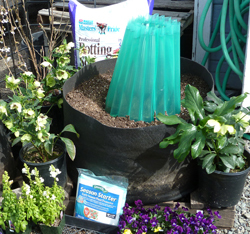 Seasoned Trinity gardeners know that it may still be too early to put these tender veggie and herb starts in the garden unprotected, but that’s why we carry Season Starter water walls, Grow It Now plant protectors, and other products to help protect your plants against the harm of spring frosts. Check out our Protecting Frost-Sensitive Plants article or stop in the nursery for more details. 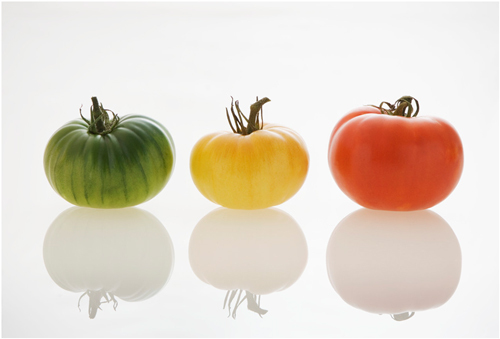 We have many certified organic, open pollinated and hybrid varieties to chose from, but if you’re looking for a special variety for your veggie garden and we don’t have it in stock, please ask! We’ll do our best to find it for you. As winter moves into spring, we all start anticipating the bounty of our summer vegetable harvest. Spring can be a little rough on frost-sensitive plants in Trinity County — both the edible and the ornamental varieties. To help you get a jump on the growing season, we carry several products that can protect your plants from frosts and freezes. If you are unsure of which is best for you, we’re happy to help you choose. Below we highlight two of our more popular options: Water Walls and Frost Cloth (with bulk volume discounts on the latter). For even more details on frost protection, read the complete article at Protecting Frost-Sensitive Plants. Water walls: The Season Starter water wall is a great product that provides more than just frost protection: it actually provides the additional heat your summer vegetables need to grow in our spring weather. Reusable water walls provide great protections for individual plants. You can set up your water wall in mid-April to help heat up the soil. When you’re ready to plant, place one of these water-filled mini-greenhouses around each of your frost-sensitive plants. Water walls can extend your growing season by up to two months! Frost cloth: Rows of seeds or plants can be protected from light frosts with medium-weight, reusable frost cloth sheets. This breathable fabric can help trap warm inside and prevent frost from settling in on your plants. We carry frost cloth in bulk — 12-foot width that is sold by the foot — which comes in two weights: .5 oz. light and 1.5 oz. medium. Volume discounts bring the price per linear foot down as low as 39¢ and 79¢, respectively. We also carry smaller, packaged frost cloth. Bareroot season usually extends into April, but it’s really up to mother nature to decide. Once our bareroot plants want to start growing, that’s it — bareroot season will be over. We are done with roses and berries, but we still have some fruit trees … until, maybe, tax day. Click on Bareroot Lists in the Nursery News Menu in the right sidebar to find out what varieties we received in February, or stop in the nursery to see what’s still in stock. Fall is a great time to plant! Why? Because our soils are still warm, encouraging new root development, and the cooler air temperatures make it much easier to water than in the hot summer months. These two acts of nature combine to help your plants become healthier and more “established” before the heat of next summer arrives. If you’re looking for fall foliage, there’s no better time to look than in fall! See the plants in all their glory. So, don’t put away your planting tools just yet! Stop in the nursery for a great selection of perennials, shrubs and trees perfect for fall planting. For more info, check out our Fall Gardening Calendar and our Adding Fall Color web pages. Trinity’s summer heat can make watering and weeding a seemingly never-ending job. But there is something you can do to lessen the strain on your garden plants. Placing a 2- to 4-inch layer of mulch around your shrubs and perennials is a great way to help your soil retain moisture. It also helps prevent weed seeds from germinating. If that isn’t reason enough to mulch, how about this: it looks fantastic! One of our favorite mulches is Black Forest Organic Compost – a premium, organic, long-lasting blend of redwood and fir bark, fortified with nitrogen and iron. It’s attractive and functional. Give it a try! Summer has arrived in Trinity County! It’s time to shift gears from planting to tending and harvesting. Water – Everything needs it, but be especially attentive to new plantings, pots and hanging baskets. Mulch helps keep moisture in. Fertilize – Veggies, fruit trees, flowers, roses, lawns. Remember to make sure your plants are well-watered before you feed them. Check out our Summer Gardening Calendar for more info on how to get the most out of your gardens this summer. Subscribe and hear about new arrivals, upcoming sales and more! Donating seeds to the Trinity Garden Club for a children's pumpkin project. Young shoppers don't let a little rain stand between them and their veggie gardens! 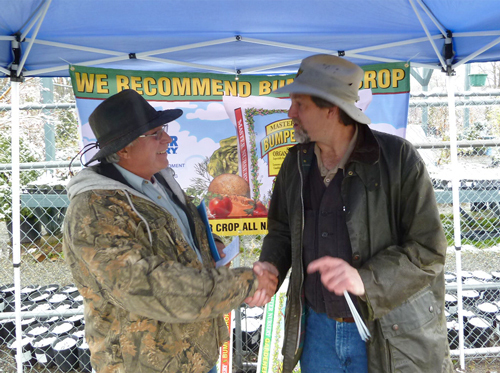 We matched your donation of lawn seed to the Weaverville Cemetery Association. Master Nursery We are proud to be a member of the Master Nursery Garden Centers co-op. This allows us to bring you great products at competitive prices. UC Davis Integrated Pest Management The UC Statewide IPM Program provides practical information on pest management techniques and identification for a broad range of California pests. Feel free to bring your bagged bugs and leaves into the Nursery. We’d love to help you ID your pest! 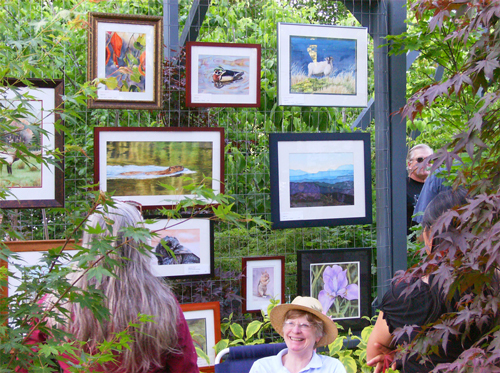 Viewing art in the Nursery; we were thrilled to be a stop on the Weaverville Art Cruise. Duncan McNeil in the Nursery to answer questions about Master Nursery's quality products. Finding out which tomatoes you like the best at our Tomato Tasting.